Arrive on Friday night for food and an introduction, then on Saturday we’ll tan fish skins and Sunday we’ll tan rabbit skins. 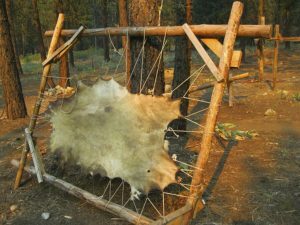 We’ll begin with a raw skin and go through scraping, braining, softening and smoking until we’re left with a soft, durable buckskin. Both bark tanning and brain tanning are taught as traditional and chemical free solutions to tanning. 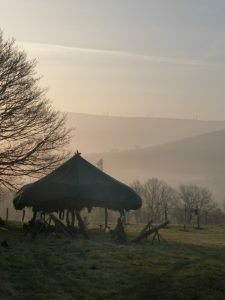 This course is taking place in an outdoor, heather thatched tannery in the settlement at Out Of Eden. Tutors – Jane Robertson and Jessie Watson Brown. Price includes all materials, camping and two meals a day. Please bring your own lunches and we will provide hearty breakfasts and dinners, shared together around a roaring fire. Tools and extra deer skins will be available at cost.